75-77 Rose Valley, CM14 4HJ Brentwood, Groot-Brittanië. The Brentwood has built a reputation for Fine Food, with achieving many Awards from the Association of Catering Excellence for quality and presentation. You will find our spacious dining room both relaxing and the ideal place to start the day. Each of our bedrooms has been individually decorated and furnished to the highest standards, achieving the Tourism council's quality standard of 4 diamonds. 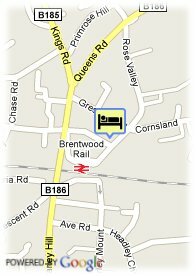 Quality furnishings, comfortable beds and impeccable cleanliness are why guests keep returning to the Brentwood. Located just a 10 minute walk from the city centre, With parking facilities and close to the Railway station, the Brentwood provides the perfect base to explore York.